Remember these??? Well -they are growing along happily - producing prodigious amounts of spinach and lettuce -and now nurturing a few tomato plants and a zucchini. Oh and some peas. So this weekend, Hubby added FIVE buckets to the system. Same concept - just smaller.. I did not get an "after" picture of these - my hands were a little dirty - but there are now tomato plants in each of these. And FOUR more buckets waiting to be filled (ran out of soil) - an eggplant, some squash, and some carrot seeds will round those out. The raised beds are planted and seem to be doing well - except that the local bunnies like to eat my baby tomatoes. We've lost 6 - but luckily I had enough seedlings to replace them (plus a few plants from my generous neighbor!). We even had an (unwanted but rare) rhubarb blossom. I've been AWOS the past month (absent with out sewing) - as I worked on the renovations of my sewing room. I still have a few tweaks to go before I post the "before and afore" pictures (Munchkin's vocabulary - makes sense to me) but the GOOD news is that I am back up and sewing again. I put my good machine in the shop for routine service during the renovations -and she's not back yet - so I am working with my older machine. I was hoping she'd do the job on a "quilt as you go" quilt assembly, but she was struggling. So on a whim the other evening - I started playing with an idea I had seen somewhere off a lattice like "eye spy" quilt using rail fence type blocks and solid blocks. I did some calculations and figured out a 12.5" block using 2.5" strips and 6.5" squares. 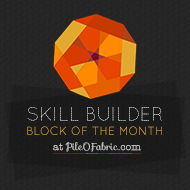 GASP - I even made a test block!!!! Then I started digging in my stash. I have wanted to make a quilt using some of the orientals that Toshi and Miyuki brought me from Japan last Christmas. I also had some other orientals that people have given me over the years - and a few that I won in blogger giveaways. Funny thing is that I don't make a whole lot of oriental style/oriental themed things - but I do have this great stash of fabrics. At first I thought I would make this "eye spy" style with different focus squares in each block, and a consistent neutral square, but then I found the fabrics that "clicked" and decided the "rail fence" blocks would be semi scrappy (5 different fabrics in the entire quilt) and the focus squares would all come from the same fabric. Taa Daa! Here they are ready to be pieced together. The neutral is a creamy tone on tone and the subtle pattern in it looks like rice grains! 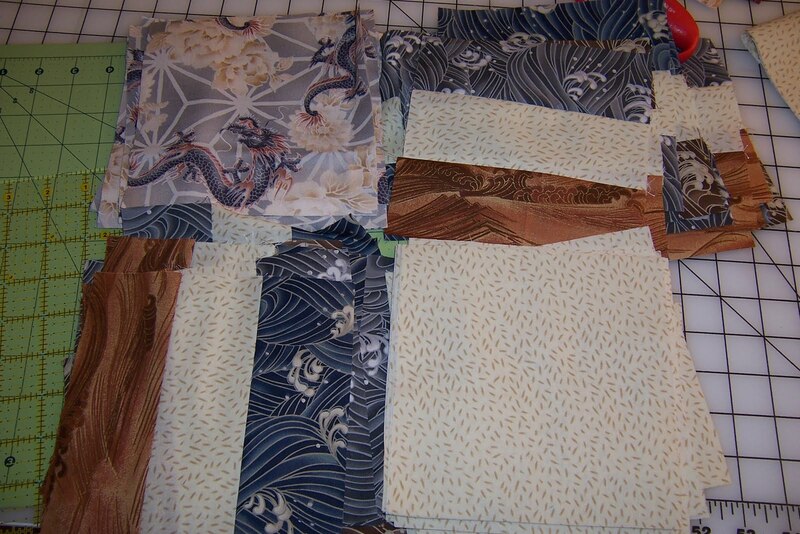 The wave fabrics were 3 FQ's, and I actually 'ran out' before I was able to get all my strips cut. I mulled it over for an evening and a day, trying to figure out how to continue without unsewing (did I mention that this was one of those "wild whim" quilts where I was flying without a complete plan in place???) Luckily I had enough "scraps" to be able to piece a few rectangles as needed, and was able to finish up the pattern as envisioned. I did do a sketch up of the entire quilt - although the coloring is a bit different from what I actually did - and will post a photo after the top is assembled. My quilting plans involve some rectangles and squares, and some Japanese family crests -and will require the FMQ capabilities of my other machine - so this one will have to go into the UFO stack for a while. I like the simplicity of this - and the large blocks do well to show off the large scale of many of the oriental fabrics. This one has a really masculine feel to it - perhaps it is the darker "rails" and the dragons?? But with some florals or other motifs, this is a quick and easy pattern that could go either way. 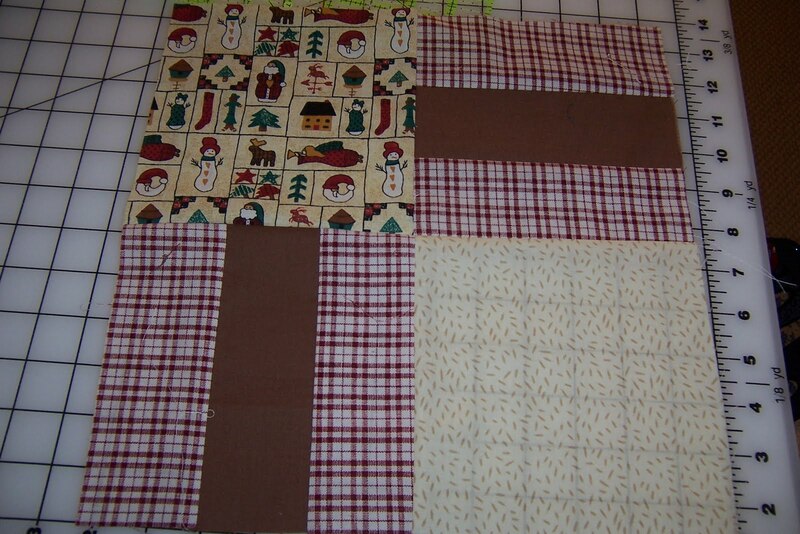 I am also contemplating this with smaller proportions - like 3" squares? It would be more delicate -but would be a good scrap buster!!! Anyway - it feels good to be sewing again! Jill wants to know how I save time and money while quilting. And since I am currently NOT able to do any quilting due to a total revamp of my studio (more on that to follow- soon - I promise) AND I am home with a sick child today - I thought I would ponder this for a few moments. The first answers are the obvious - shop sales and coupons. Be it your LQS or JoAnn's or whatever store you prefer - find a way to score any discounts you can. I like my Gutermann thread -and buy neutrals for piecing - the biggest spools I can get - but only when I have a coupon or it is on sale. Next - scrap quilt... I use bits down to 1" square for various projects so I get the most out of every yard. Third - become a frequent customer at your local library! Quilt books and patterns abound - at least here -and help fulfill that urge for new books and patterns. 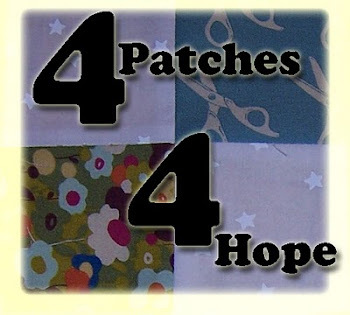 Online resources for free quilt patterns are numerous, too - I have a digital file folder full of patterns that could keep me quilting for the next many years!!! Fourth -don't be afraid to fly without a pattern! Some of my scrappy "improvisations" have worked because I took techniques and ideas from other patterns and books and ran with them, making something my own (and using up scraps in the process). Once you have the basics down from a few quilts - you should be able to figure it out! Fifth - repurpose! I do this more in craft sewing than in quilting, but my hubby's worn out jeans or plaid shirts find new life in my scrap bin to be turned into something fun! Sixth - shop for projects, not for stash (yeah - I fail at this all the time). Saving time? I will have to get back to you on that one. Any suggestions? Help support my brother Bill in his fundraising ride. Last Friday I took a half day off work so that Hubby and I could attend the opening session of the 2011 MD20 Lions Club Convention. As many have read before, both of us are active in Lions and hold or have held various volunteer positions at the club, local and state level. At the opening session on Friday afternoon I was being honored with the Past District Governor's Association leadership award for my district. We headed to downtown Rochester after working part of the day, and enjoyed the opening ceremonies, where I was also surprised and humbled by a gift of appreciation from the current Council of Governors for my work with the MD20 Lions Leadership Institute over the past 6 years. It was wonderful when they asked all the Leadership Institute graduates in the room to stand, and that included a large number of the people on the stage, and many many in the audience. Quite a touching moment for me, especially as I have stepped down as coordinator of the Institute... I needed a break. After the PDG awards were presented, Hubby and I were very hungry and decided to slip out of the opening session and get some dinner (and celebrate) - we had a long evening of socializing ahead and I know my limits of going without food... so we slipped out before the opening session was entirely finished and went to Dinosaur BBQ just down the street for some dinner, also figuring we would get in and through before it got crowded. That's when the trouble began... see neither of us knew that I was to receive another award at that opening session - the International President's Leadership Award ( I think I got the title of that right)... no one who knew had tipped us off to stay put, and most other people did not know either.. and when they called my name... we weren't there.... to make it worse it was a very good friend and mentor who was making the presentation (and who was picked up by the mic saying "I'm gonna kill her!" or something like that!). We actually got back from dinner when the session was just finishing up - and I got "caught." Boy did I feel like a schoolgirl caught skipping class! Luckily my peers have a great sense of humor - and although I took ribbing for it all weekend, I did return to the formal session on Sunday morning where the medal was presented to me with lots of pomp and circumstance. It was another great weekend to be a Lion!